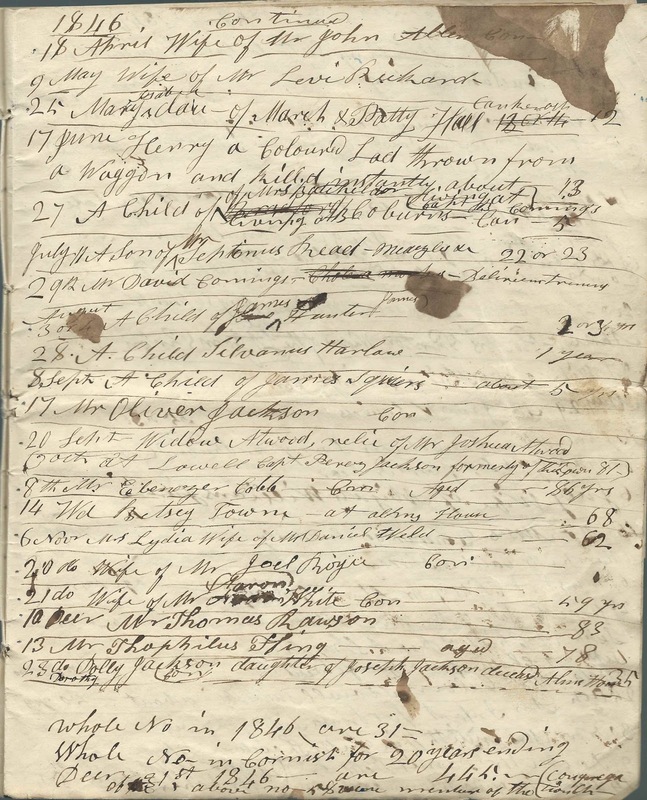 Pages from a journal handwritten by an unknown person, but likely by a descendant of William Ripley, that lists the deaths at Cornish, New Hampshire from 1826 to 1850. This post covers deaths in 1846. This was a hard year for the family of Paschal Smith, which lost 4 members, one in February, two in March and one in April. Wife of Theophilus Fling. Erepta (Carpenter) Fling, who died January 7, 1846; as mentioned on page 164 in History of the Town of Cornish, New Hampshire, with Genealogical Record, 1763-1910, Volume 2. Her husband, Theophilus Fling, would die later this year, on December 12. Wife of Mr. Noah White - Bapt. 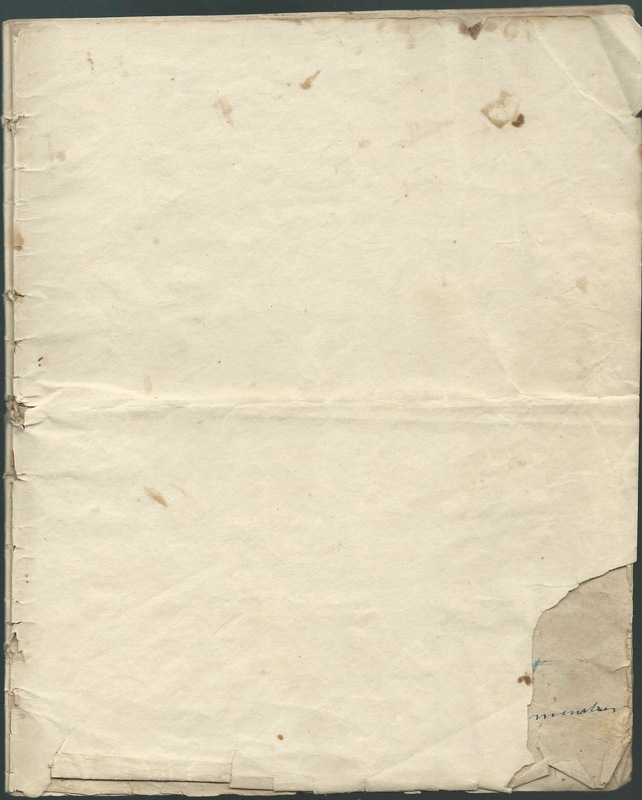 Submit (Rounds) White, mentioned as having died on January 7, 1846 on page 413 in History of the Town of Cornish, New Hampshire, with Genealogical Record, 1763-1910, Volume 2. 10 or 11 - Widow Comings, relict of David C., deceased - On the Flat, Cm, Bm, 79. Phoebe (Hall or Wyman) Comings, wife of David Comings; mentioned as having died on February 12, 1846 on page 116 in History of the Town of Cornish, New Hampshire, with Genealogical Record, 1763-1910, Volume 2. 16 - Benjamin Comings 2nd, Con. I found several Benjamin Comings' but not one who died on this date. Hopefully a reader share an insight. 23 - A Child of Paschal Smith - 6 yrs. Possibly the father was the Paschal Smith, who was born October 25, 1812, son of Gideon Smith and Lucy (?) Smith, as mentioned on page 328 in History of the Town of Cornish, New Hampshire, with Genealogical Record, 1763-1910, Volume 2. I believe Paschal's wife was Elizabeth S. (?) Smith or Elizabeth (S?) Smith. The child may have been John Smith, who was born in 1840 and whose stone shows that he died on February 22, 1846. 4 - 2nd Child of Paschal Smith - about 4 do. Possibly the father was the Paschal Smith, who was born October 25, 1812, son of Gideon Smith and Lucy (?) Smith, as mentioned on page 328 in History of the Town of Cornish, New Hampshire, with Genealogical Record, 1763-1910, Volume 2. I believe Paschal's wife was Elizabeth S. (?) Smith or Elizabeth (S?) Smith. Perhaps the child was Lucy M. Smith, born about 1842 and died March 5, 1846. 10 - 3rd and youngest child of Paschal Smith - Infant, 18 mos. Possibly the father was the Paschal Smith, who was born October 25, 1812, son of Gideon Smith and Lucy (?) Smith, as mentioned on page 328 in History of the Town of Cornish, New Hampshire, with Genealogical Record, 1763-1910, Volume 2. I believe Paschal's wife was Elizabeth S. (?) Smith or Elizabeth (S?) Smith. Perhaps the child was Abby S. Smith, whose stone shows that she was born about 1844 and died on March 11, 1846. 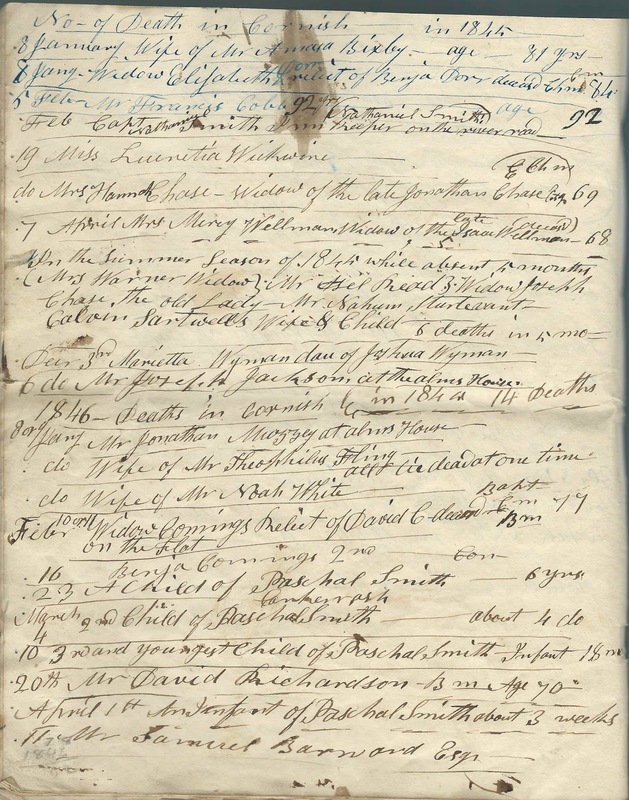 20 - Mr. David Richardson, Bm, Age 70; mentioned on pages 306 and 307 in History of the Town of Cornish, New Hampshire, with Genealogical Record, 1763-1910, Volume 2. 1 - An Infant of Paschal Smith - about 3 weeks. Possibly the father was the Paschal Smith, who was born October 25, 1812, son of Gideon Smith and Lucy (?) Smith, as mentioned on page 328 in History of the Town of Cornish, New Hampshire, with Genealogical Record, 1763-1910, Volume 2. I believe Paschal's wife was Elizabeth S. (?) Smith or Elizabeth (S?) Smith. Perhaps the child was Joshua B. Smith, born in 1816 and died April 1, 1846. 11 - Mr. Samuel Barnard, Esq. 18 - Wife of John Allen - Con. Perhaps Dolly Allen, wife of John Allen; Dolly's gravestone, a photograph of which is attached to her Find a Grave memorial, shows that she died in April 1846 - the memorial gives the date as April 23, 1846, but I can't read the stone well enough to determine for myself. There's information on a John Allen on page 4 in History of the Town of Cornish, New Hampshire, with Genealogical Record, 1763-1910, Volume 2 - which adds to the confusion because it lists Dolly as John's first wife, but gives no death date for Dolly and then gives the death date for John's second wife Hannah (Goldthwaite) Allen as October 23, 1823. I'm assuming that the book transposed the wives. 9 - Wife of Levi Rickard; mentioned on page 314 in History of the Town of Cornish, New Hampshire, with Genealogical Record, 1763-1910, Volume 2. 25 - Mary, daughter of March and Patty Hall - ??? Mary Isabella Hall, born December 27, 1833, daughter of Moody March Hall and Martha Joslyn (Chase) Hall, whose nickname was presumably Polly, as mentioned on page 181 in History of the Town of Cornish, New Hampshire, with Genealogical Record, 1763-1910, Volume 2. 11 - A Son of Septimus Read - Meazles [sic] - 22 or 23. Bela Philander Read, born in 1824, son of Septimus Read and Betsey (Chapman) Read, as mentioned on page 300 in History of the Town of Cornish, New Hampshire, with Genealogical Record, 1763-1910, Volume 2. 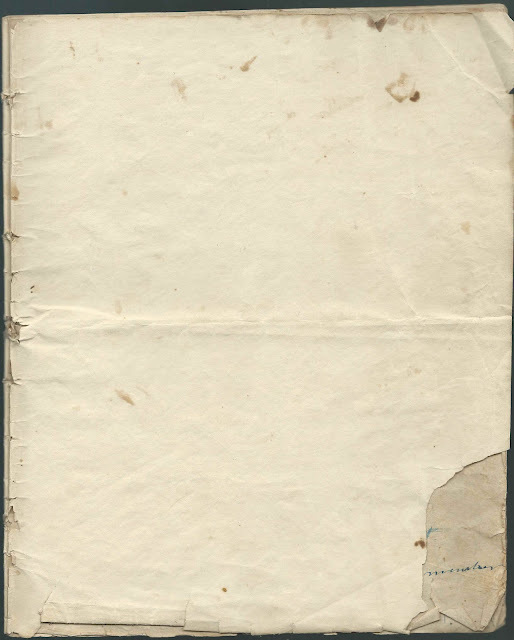 29 - Mr. David Comings - [cholera crossed out] delirium tremens; as mentioned on pages 116 and 117 in History of the Town of Cornish, New Hampshire, with Genealogical Record, 1763-1910, Volume 2. 3 or 4 - A Child of James Hunter - 2 or 3 yrs. John Merrill Hunter, born September 18, 1844, son of James Sumner Hunter and Zilpha (Worthen) Hunter, as mentioned on page 218 in History of the Town of Cornish, New Hampshire, with Genealogical Record, 1763-1910, Volume 2. 28 - A Child of Sylvanus Harlowe. Edwin Harlow, born August 1, 1845, the older of the two sons named Edwin of Sylvanus Harlow and Elvira M. (Leslie) Harlow, as mentioned on page 191 in History of the Town of Cornish, New Hampshire, with Genealogical Record, 1763-1910, Volume 2. 8 - A Child of James Squiers - about 5. Family name also seen as Squires. Shown as a child of James Squires and Phebe (Farrington) Squires, as mentioned on pages 346 and 347 in History of the Town of Cornish, New Hampshire, with Genealogical Record, 1763-1910, Volume 2. 17 - Mr. Oliver Jackson, Con; mentioned as having died on September 16, 1846 on page 222 in History of the Town of Cornish, New Hampshire, with Genealogical Record, 1763-1910, Volume 2. [presumably October] - at Lowell, Capt. Perez Jackson, formerly of this town, 81; mentioned as having died at Nashua, New Hampshire, on October 3, 1846 in a sketch on pages 220 and 221 in History of the Town of Cornish, New Hampshire, with Genealogical Record, 1763-1910, Volume 2. 8 - Mr. Ebenezer Cobb, Cm, Aged 86 years. Presumably the Ebenezer Cobb shown as having died on October 15, 1846 on pages 93 and 94 in History of the Town of Cornish, New Hampshire, with Genealogical Record, 1763-1910, Volume 2. 6 - Mrs. Lydia, Wife of Mr. Daniel Weld - 62. Lydia (Fuller) Weld, born June 6, 1784, as mentioned on pages 394 and 395 in History of the Town of Cornish, New Hampshire, with Genealogical Record, 1763-1910, Volume 2. 21 - Wife of Mr. Aaron White - Con, 59. Rebecca (Williams) White, born March 30, 1788, first wife of Aaron, White, as mentioned on page 413 in History of the Town of Cornish, New Hampshire, with Genealogical Record, 1763-1910, Volume 2. 10 - Mr. Thomas Rawson, 83. Shown as having died on December 10, 1847 on pages 297 and 298 in History of the Town of Cornish, New Hampshire, with Genealogical Record, 1763-1910, Volume 2. His Find a Grave memorial also shows a death date of December 10, 1847, but the accompanying photograph of his stone isn't detailed enough to show a date or it has faded away. 13 - Theophilus Fling, 78; mentioned as having died on December 12, 1846 on page 164 in History of the Town of Cornish, New Hampshire, with Genealogical Record, 1763-1910, Volume 2. His wife, Erepta (Carpenter) Fling, had died earlier this year, on January 7. 23 - Dolly Jackson, daughter of Joseph Jackson, deceased - Alms House, 35. Mentions Dorothy, which is presumably her name, with Dolly as a nickname.